A drive to the mountains near where I live seemed like a good adventure over the weekend. After an hour of driving I started to see hills that soon turned into mountains. When I got off the highway there was an entrance to the Blue Ridge Parkway. The morning was getting more and more interesting! I decided to drive on it for a while and every couple of miles there was a lookout point. I stopped, got out of the car and took a good look at the mountains. It became breezy as the road ascended and I needed to wear a sweater as I looked out to see these panoramic views. Since I also enjoy flowers I thought that these wildflowers were a charming part of the landscape. The events of this day produced some wonderful memories. 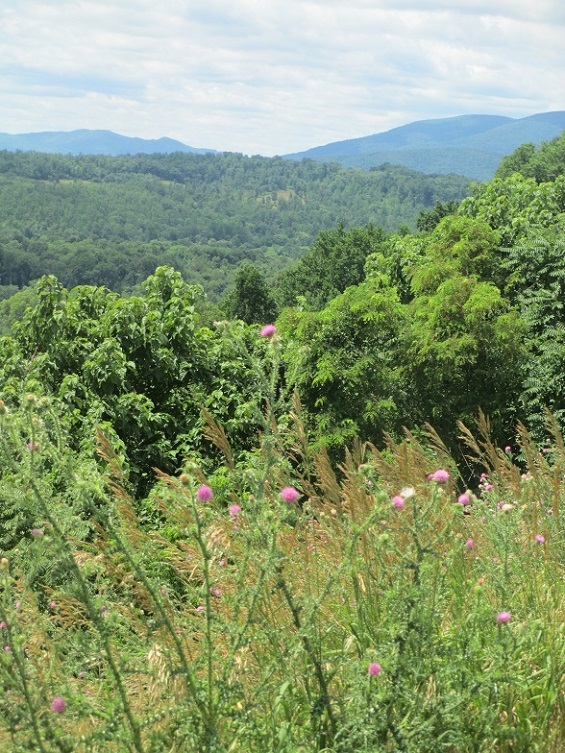 This entry was posted in Travel, USA and tagged Blue Ridge Parkway, mountain views, mountains, summer. Bookmark the permalink. And a little cooler in the higher elevations than at sea level where I’m at right now. Happy summer Meg. I love the Blue Ridge Mountains, they’re especially incredible during autumn. We went there while we were exploring Shenandoah and the surrounding areas. It’s gorgeous country! I’m really looking forward to going back in the fall to see the foliage – it’s beautiful right now too! We drove the Blue Ridge Parkway last year. It is indeed beautiful – stunning views. That must have been a wonderful experience – I’d like to do that sometime! Sight seeing close to home is often full of surprises. Excellent set of beautiful photos. I love all of them. Thank you so much – it was wonderful to see these mountains! beautiful gallery of gorgeous views! It was a day I’ll remember for a long time! I think that mountain views are so impressive! Thank you Amy – it’s fun to find new places to photograph! It was an marvelous day that I won’t soon forget! It is so much fun to go on an adventure and this was a great experience! We were in that vicinity over July 4th weekend. I hadn’t seen the mountains in a long time, and enjoy seeing your photos. I managed to delete the photos from my Nikon’s card without downloading them. Glad there were a few on my cell phone! It was a beautiful day and I want to go back to the mountains in the fall when the leaves are changing color – it should be really lovely!